In this Photoshop tutorial, we're going to look at how image resolution affects print quality. Have you ever downloaded an image from the internet and then printed it, only to get results that were, well, less than you expected? The image looked great on your computer screen, but when you printed it, it either printed at the size of a postage stamp or it printed at a decent size but looked blurry or "blocky"? The culprit is image resolution. Actually, that's not really fair to say. Image resolution didn't purposely set out to make your life miserable when you printed your internet photo. The problem was simply that most photos on the internet have very small pixel dimensions, usually in the neighborhood of 640 pixels wide by 480 pixels high, or even smaller, and that's because images don't need to be very large in order to appear at a decent size and good quality on your computer screen, and also because smaller images download much faster on websites than larger images do (which is a whole other topic that we don't need to get into here). So what can you do to make photos you download off the internet appear just as high quality when printed as photos you took yourself with your digital camera? The answer - absolutely nothing. There simply are not enough pixels in most internet images to allow them to print at high quality, at least not without printing them at the size of a postage stamp, that is. Let's find out why. First of all, let's get off the topic of downloading images from the internet, since we really shouldn't be doing that anyway without permission from the copyright owner, and look at image resolution in general. I cover it in much more detail in the Image Resolution, Pixel Dimensions and Document Size tutorial, but let's do a short recap. The term "image resolution" means how many of your image's pixels will fit inside each inch of paper when printed. Obviously, since your photo has a fixed number of pixels, the more of them you squeeze inside each inch of paper, the smaller the image will appear on the paper. Likewise, the fewer pixels you print per inch, the larger the image will appear on paper. The number of pixels that will be printed per inch is known as the resolution of the image, or "image resolution". Image resolution has everything to do with printing your image. It has nothing to do with how your image appears on your computer screen, which is why images you download off the internet usually appear much larger and higher quality on your screen than they do when you print them. An unflattering photo of a horse. 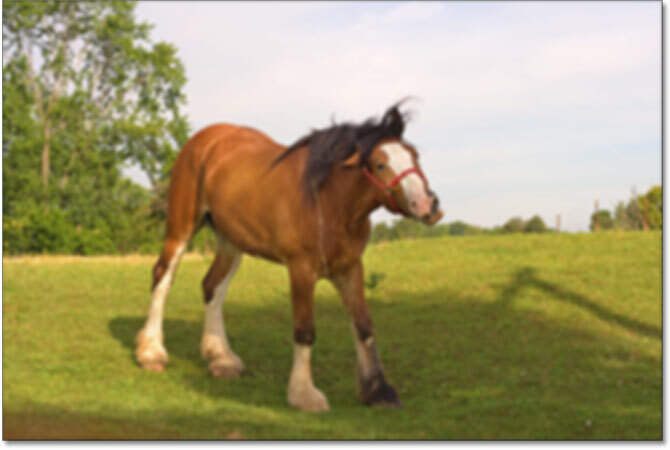 I can't help but laugh every time I see this photo of a horse I took while driving around the countryside one day. Normally this horse stands proud, powerful, full of grace and dignity, yet I seem to have caught him in a rather unflattering moment. He's standing on a bit of a strange angle, he has a piece of straw dangling from his hair, and he seems to be in the middle of chewing his food. Either that, or he's desperately trying to crack a smile for me. In either case, since this guy is already embarrassed, as am I for having taken this wonderful photo, let's use this image as an example. The Image Size dialog box shows us the current size of the photo. The Document Size sections tells us how large or small the photo will print based on a specific resolution. The Document Size section of the Image Size dialog box tells us two things - what the current resolution of our image is, and how large or small the image will appear if we print it based on that resolution. Currently, our resolution value is set to 72 pixels/inch, which means that out of the 1200 pixels that make up our photo from left to right (the width), 72 of them will print inside each inch of paper, and out of the 800 pixels that make up the image from top to bottom (the height), 72 of them will print inside each inch of paper. The value in the Resolution box is for both width and height, not the total number of pixels that will print. In other words, for every square inch of paper, 72 pixels from our image will be printed from left to right and 72 pixels will be printed from top to bottom. The total number of pixels printed in every square inch of paper would then be, in this case anyway, 72 x 72 (72 pixels for the width times 72 pixels for the height), which gives us 5184 pixels! Confirming the print size shown in the Document Size section. That's exactly what it says! 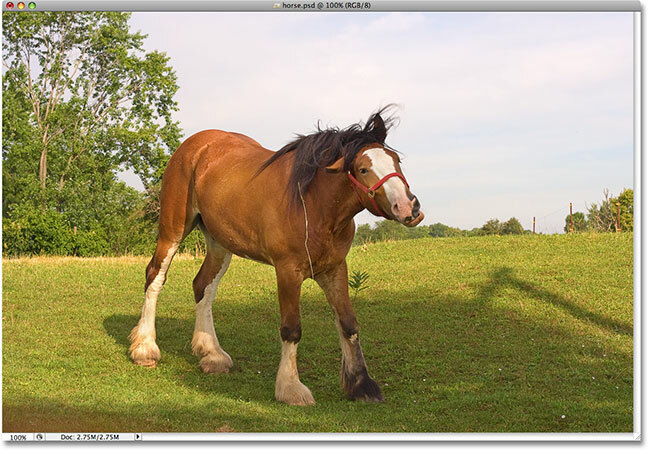 Wow, a 1200 x 800 pixel photo is large enough for an 11 x 14 inch print, with a little extra to spare! That's great! Sadly, no. If only life were that simple. The photo as it would appear on paper when printed at only 72 pixels/inch. Doesn't exactly look good, does it? The problem is that at 72 pixels/inch, the image information is being spread out too far on the paper for the photo to appear sharp and detailed, sort of like spreading too little peanut butter over too much toast. The photo now appears soft, dull and generally unappealing. We don't see this problem on a computer screen because computer monitors are generally referred to as low resolution devices. Even a photo with relatively small pixel dimensions, like 640 x 480, will look great on a computer screen. Printers, however, are high resolution devices, and if you want your photos to appear sharp and detailed when printed, you'll need a resolution much higher than 72 pixels/inch. So how high of a resolution value do you need for professional quality printing? The generally accepted value is 300 pixels/inch. Printing an image at a resolution of 300 pixels/inch squeezes the pixels in close enough together to keep everything looking sharp. In fact, 300 is usually a bit more than you need. You can often get by with a resolution of 240 pixels/inch without noticing any loss of image quality. The professional standard, though, is 300 pixels/inch. The print resolution has been changed to 300 pixels/inch. The photo will now print at a much smaller size than before. Higher print resolutions result in smaller photos but much better image quality. Of course, most people don't print their photos at weird sizes like 4 x 2.667, so how do we make sure we're going to get professional quality print results with more standard print sizes like 4 x 6? An excellent question, and the answer comes to us once again through some boring yet simple math. Based on our math, we can see that in order to print a digital photo as a 4 x 6 at 240 pixels/inch resolution, which should give us excellent quality, our photo's pixel dimensions need to beat least 960 x 1440. We can see exactly how many pixels that is by multiplying 960 by 1440, which gives us 1,382,400 pixels. Let's round that up to 1.4 million pixels. That may sound like a lot of pixels but it really isn't, not when you consider that 1.4 million is the minimum number of pixels you'd need to print good quality 4 x 6 photos using the minimum resolution we can use to achieve good quality, which is 240 pixels/inch. The good news at least is that these days, most digital cameras on the market are 5MP ("mega pixels", or "millions of pixels") and higher, so they'd have no trouble printing good quality 4 x 6's even using 300 pixels/inch for the resolution. So, in order to print a photo as a 4 x 6 using the professional standard of 300 pixels/inch for resolution, our photo needs to be 1200 pixels wide by 1800 pixels high (or vice versa), which means we'll need a total of 2,160,000 pixels, which again should be no problem for most digital cameras on the market today which are 5MP and higher. From our little bit of math, we can see that in order to print a photo at good quality as an 8 x 10, our photo needs to be 1920 pixels wide by 2400 pixels high (or vice versa), for a total of approximately 4.6 million pixels. Now we're starting to push the limits of lower end digital cameras. A 4MP digital camera wouldn't capture quite enough pixels to be able to print an image at 8 x 10 at 240 pixels/inch resolution. It would fall about 600,000 pixels short. You could still print an 8 x 10 image of course, but you most likely wouldn't get professional looking results. Now we're really pushing the limits as far as digital cameras currently on the market. In order to be able to print a photo as an 8 x 10 using the 300 pixels/inch resolution standard, our photo needs to be 2400 pixels wide by 3000 pixels high (or vice versa), for a total of 7.2 million pixels! Now that's a lot of pixels! This means you need at least a 7.2MP digital camera in order to be able to print your photos as 8 x 10's and still get true, professional quality prints. Of course, keep in mind that most photos require at least a little cropping, which means you'll need to start with even more pixels. If you know you're going to be printing a lot of photos as 8 x 10's, investing in a good quality 8 MP or higher camera is highly recommended. And there we have it!